Picture the scene, it’s 6.30pm, you get home from work and you’re exhausted, there’s a load of mail at your feet as you open the door, nowhere to put your keys (so you can never find them in the morning), the banister is overflowing with coats and you can hardly move for shoes and bags on the floor. 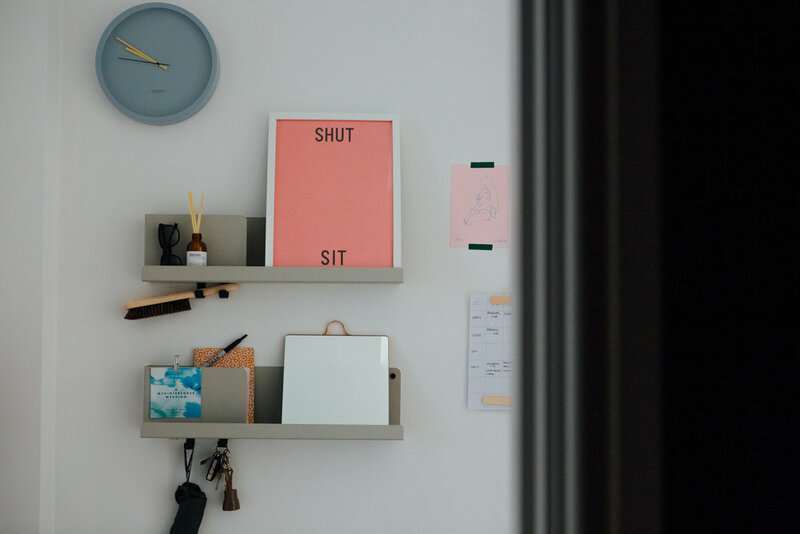 Your hallway might not be at the top of the list of priorities for home improvement but you would be surprised by what a difference having a spruce up could have to your daily routine (and stress levels leaving/ returning home). Often the unofficial dumping ground of the house, especially when children are involved, your hallway can become an area of chaos and a source of stress every time you are trying the leave on time. Restoring order in my own hallway has almost banished stressy mornings where I cant find anything, and I’ve even found it has had a knock on effect in the rest of the house. Here are the five things I did to turn my hallway from the worst place in the house, to the most serene! Imagine if there was somewhere you could hook your keys and umbrella, file away post until a later date, and pin important messages? Enter the Muuto Folded Shelf which do all of the above and come in five gorgeous colourways. Ikea, Nomess and Nkuku all do their own versions too but these are definitely my favourite. I got so fed up with everyone throwing their coats on the banister, or worse the back of dining room chairs I needed to find a solution for what I coined coat city-a few pegs just weren’t cutting it for our family of four. I found a maker on etsy who uses old pipework to make hanging racks so I had two mounted on the wall and bought a load of hangers. It works great for us- eliminating the option to pile five coats on one hook, every coat has its own hanger and it looks infinitely more tidy. I can now also see what coats we have- joy! Ikea do an adjustable version on the wall mounted hanger which is a bargain at £5 a go. 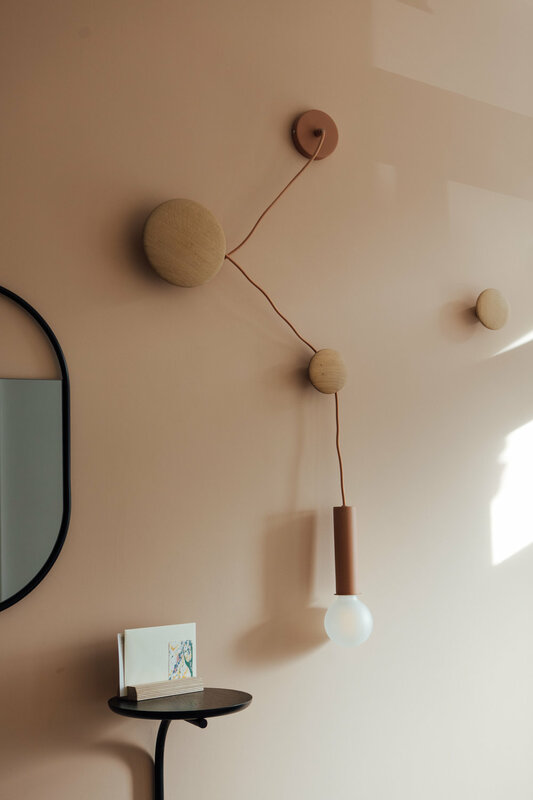 In addition to this I also added some extra wall hooks the ‘dots’ from Muuto for hanging my handbag on and for when we have friends and family visiting. In the interests of creating as much floor space as possible to achieve a more clean and uncluttered feel I tried to use the walls as much as possible to provide storage. 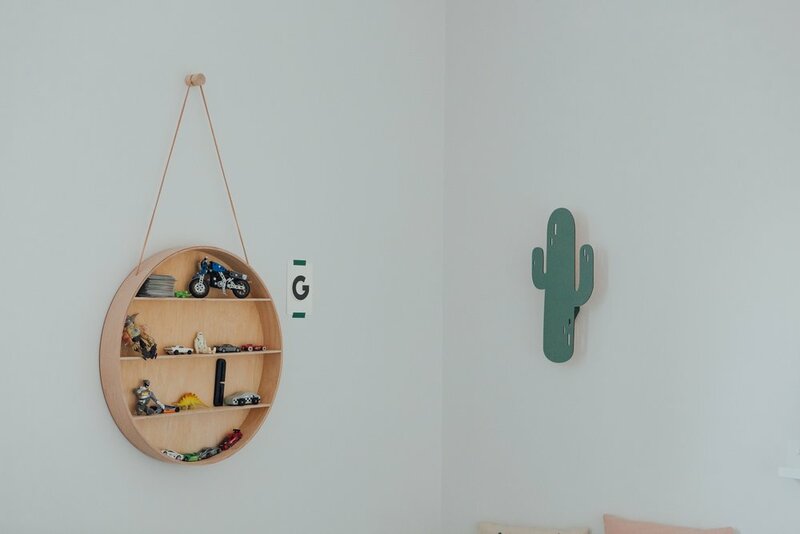 I also applied this approach to shoe storage and found some super fun wall-mounted shoe shelves from Swedih brand Maze. I got three racks and places them side by side and we also now have a rule in our house that each of us is only allowed three pairs of shoes downstairs at any given time, Its worked wonders! This is a must for me with children that aren’t the best at doing their shoelaces! 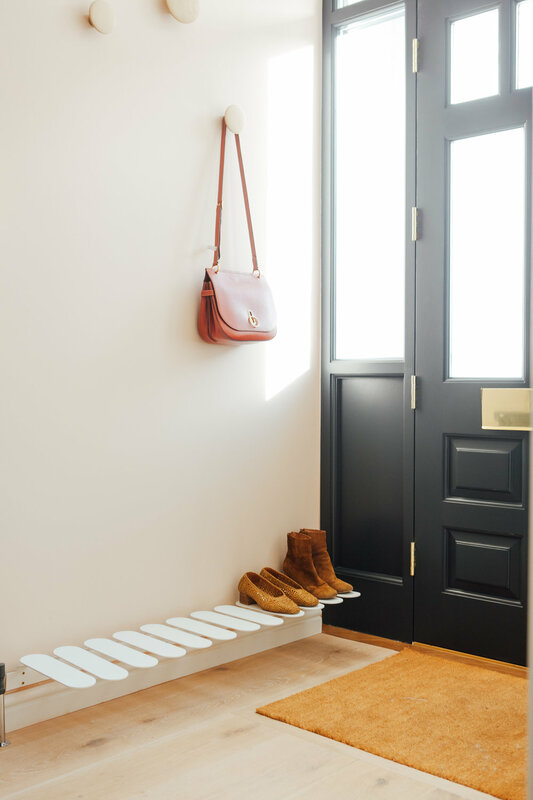 If you can fit a bench or even a stool in your hallway it makes such a difference getting ready in the morning and taking shoes off at night. If space is really tight, something wall-mounted which flaps down when you don’t need it will work just as well. We have a bench from Hay which doubles up as extra dining table seating when we have friends for dinner. Whether you are redecorating a room or doing a full refurb, lighting is one of those things that can often get overlooked, even though its actually one of the most important elements of your room and one that will impact every other carefully chosen aspect of your interior! 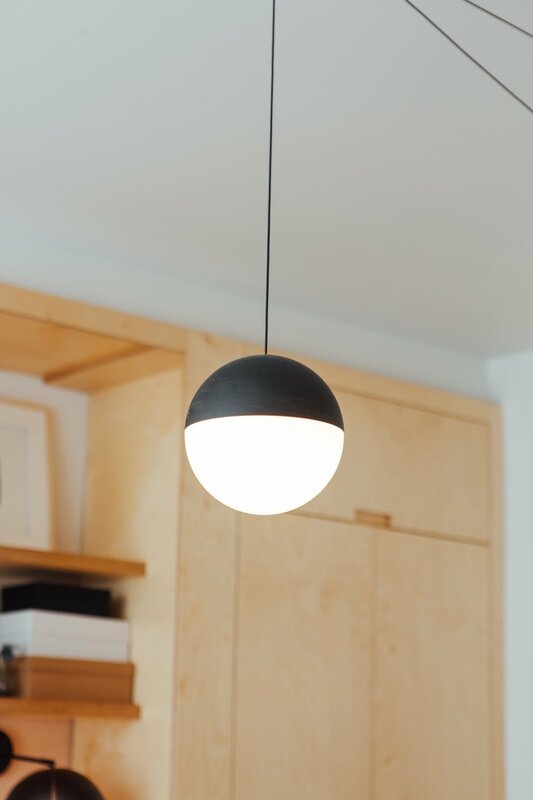 Here’s a few tips to help you avoid falling down the proverbial black hole of lighting design (which often ends in a panicked trip to your local DIY centre and a room which feels like a doctors surgery every time you switch the lights on). Whether you are changing the lighting in your kitchen, bathroom or hallway (or anywhere else for that matter) the first thing to do is define the areas of the room and how they will be used. Are their any areas that you will need extra light to complete a task- such as chopping vegetables, reading a book or doing your make up? This is where task lighting is essential- some well-positioned wall lights or in a larger space recessed down-lights might be necessary. What about the mood? 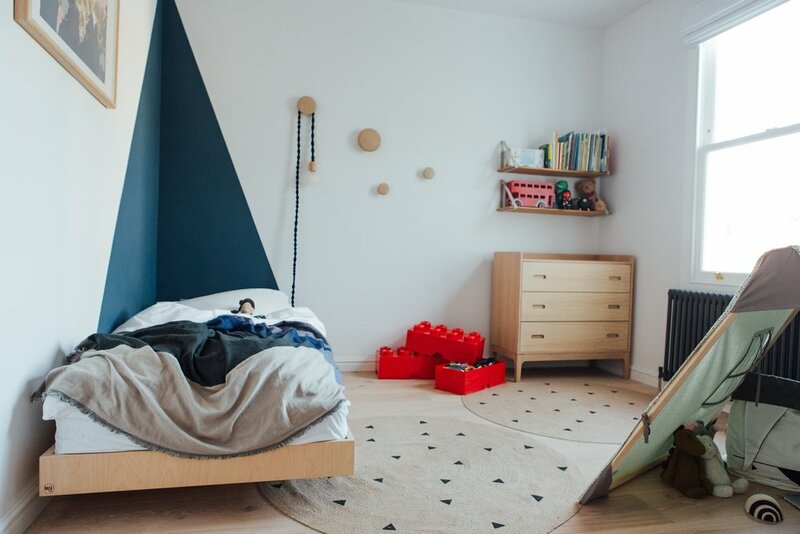 How do you want the room to feel at different times of the day? Task lighting alone will create a colder environment (and could end up feeling like an office! ), so I always recommend having these lights on a dimmer so you can choose the brightness depending on the time of day and how you are using the room. Another effective way to balance task lighting is with softer lights- this could be with a pendant on a dimmer as well as desk and floor lamps, these will be become your ‘feature lights’ so be dont be afraid to get creative when selecting these. Once you establish how you are going to use the room and at what times it will be much easier to select a lighting scheme which will reflect the personality of the room at any given time. 2. How many lights do I need? My personal thoughts on this is that you can’t really have too many lights (as long as you follow a few simple rules) but you can definitely end up not having enough if you are overly cautious with your lighting scheme. If you think you 5 spotlights over your kitchen worktop is enough- sketch it out and you might find that 8 would be a much better and more evenly spaced number. 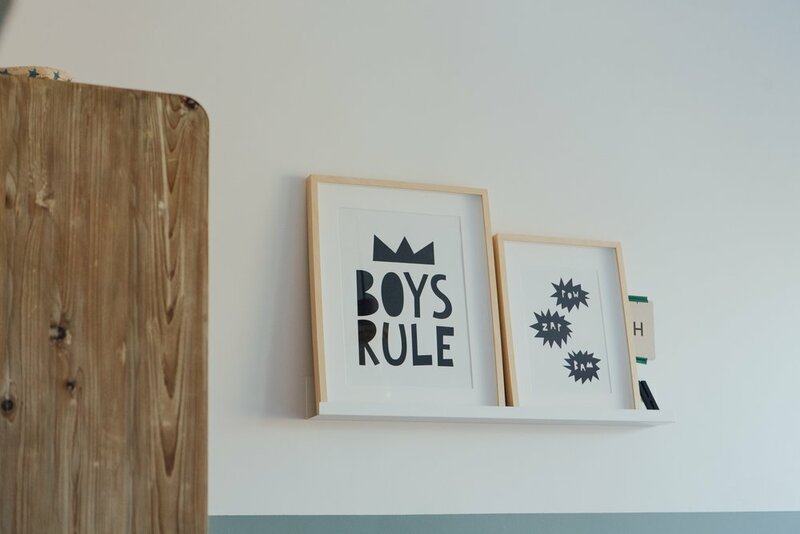 Don’t be afraid of adding more at this stage, the additional cost will be minimal and a much better outcome than trying to cook in a dark kitchen or having to put desk lamps on worktops. As long as you select the right switches and bulbs (see below), including a few extra lights in your scheme is a much wiser option than going for a minimal scheme and regretting it once its too late. There are three key things to remember with switches. First is do you want to be able to dim these lights? Unless they are wall lights, hallway lights or bathroom lights I would normally answer yes to this question. Dimming switches give you an extra layer of control over your lighting and the mood they create which can only be a good thing in my eyes. If you are opting for dimmer switches on LED lights make sure the dimmer switches are LED compatible (not all are) or they will not work. Second thing to note when choosing switches is how many of individual lights in your scheme you would like to operate on their own. 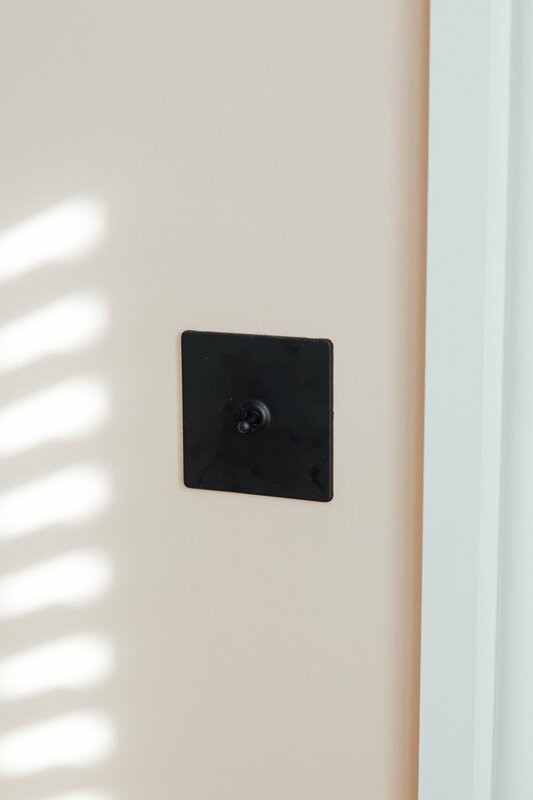 For example, you might have a pendant in your hallway and a wall light on the same run, if you would like to be able to have the option to have the pendant on but not the wall light, or vice versa, opt for a ‘two gang’ switch. The ‘two gang’ just means two switches. In most cases I would always recommend having pendants and wall lights on their own switches to give you that additional layer of control over your lighting. The pendants in my living room used to be on just one (‘one gang’) dimmer switch even though there was three and it was so annoying not to be able to operate each one individual to create a bit more texture and atmosphere in the room. Its small thing but one that makes all the difference, I promise! Finally is the matter of what finish of switches you choose. Budget obviously comes into play here, but if you can afford to spend a little bit more on your switches I assure you you wont regret. This is something you will see and touch numerous times a day and it can make such a difference if you upgrade from the plastic switches to a metal finish. My favourites are from Dowsing and Reynolds but there are so many options out there (from the likes of Homebase and B&Q) that wont break the bank. Don’t underestimate the importance of choosing the right bulbs. You could have the most beautiful lights but without the right bulbs they will never shine as well as they should do! LED are the best option for your task lights for brightness and durability, but I would always recommend opting for a warm LED below 3000k lumens, ideally between 1800 to 2400k to avoid what I call doctors surgery syndrome. For your mood lighting dimmable LEDs are also a good (and more cost-effective) option but be sure to opt for a warmer option of 2400k or below. Alternatively, for lights that are less often used and purely mood enhancers a warm halogen will still work a treat. Another way to add depth and personality to your lighting scheme is to play around with symmetry and scales. Who says that all lights need to be in a perfectly symmetrical line? Or all pendants to be hung at the same height from the ceiling? 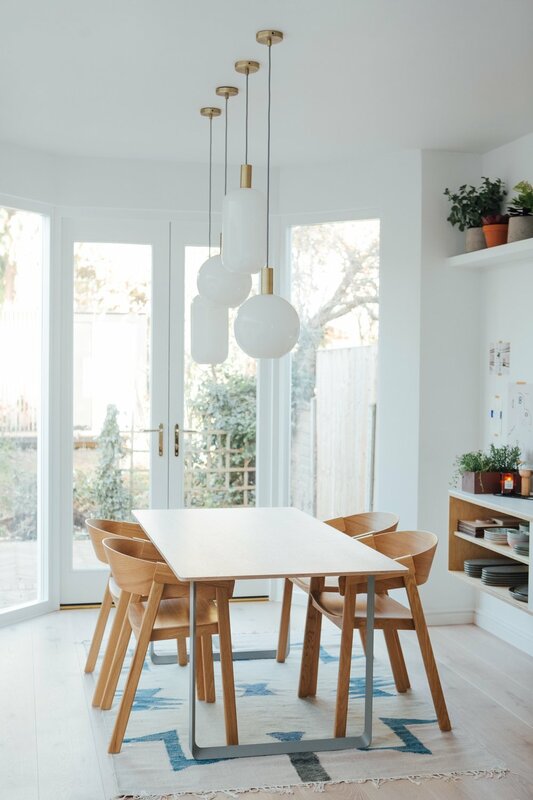 Dropping your pendants over the dining table at different heights is a playful way to create a focal point in the room or positioning your down-lights in a less formal arrangement around your kitchen will soften the look and feel of what are usually the ‘boring but necessary’ lights in the room. A personal favourite of mine in the bedroom or living room is to drop a pendant down to around a couple of metres above the ground over a coffee table or bedside table to frame the area. 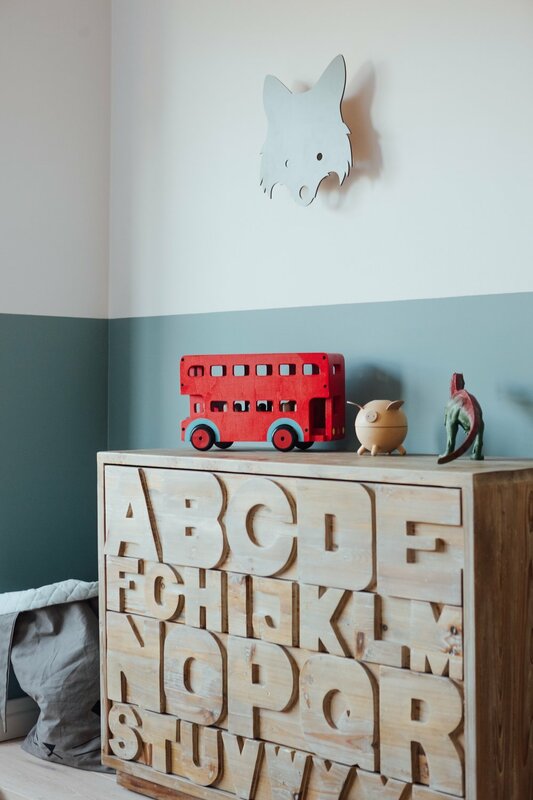 It creates a lovely cosy area and also a great tool for curating a pile of your favourite books and objects for display.